Certain patients are at risk of injury from becoming trapped within the rails of their bed, and so precautions must be taken to avoid this occurring. 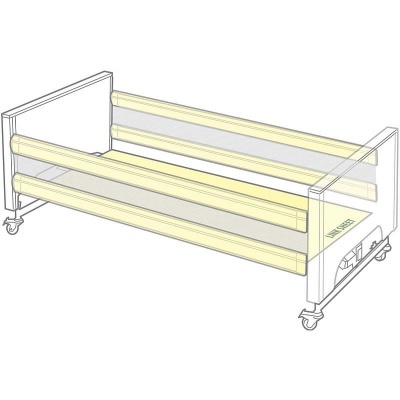 The Harvest Two Bar Bumper with Anti-Entrapment Sheet is designed to prevent a patient's limbs from getting caught within the bed rails and softens any impact between body and rail. This bumper is specially designed to be easy to use with a profiling bed. This product is especially effective for those at high risk of entrapment, in particular patients with senility or Alzheimer's disease. The Harvest Two Bar Bumper is a snug fitting zip-on bumper, designed to fit over wooden side rails. This bumper uses side netting between the two bars to improve visibility for the patient. 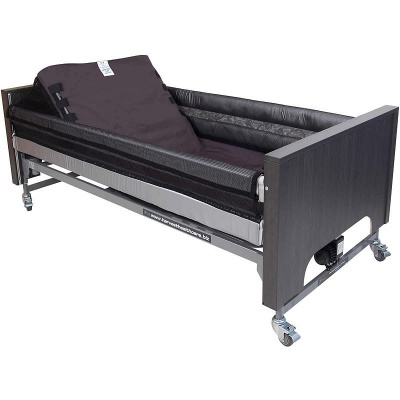 This product has an anti-entrapment sheet which is elasticated to enable the use of a profiling bed. The Harvest Two Bar Bumper is supplied with a two-way stretch vapour-permeable cover, which allows the product to breathe whilst protecting it from any spillages or secretions. Please note that the image shows the bumper attached to a bed, this product includes a bumper only.